Boulder Junction is just the cutest Northwoods Wisconsin town. From the inviting and vibrant mainstreet, to the well maintained bike trails and the beautiful lakes in the area everything screams “Enjoy the Northwoods!”. If you stay at one of our Boulder Junction vacation rental properties, check out the event below that you can enjoy while you’re there. Follow this link - - > HERE to find a current year calendar of events for Boulder Junction. On this calendar you’ll find events for the active vacationer, like the White Deer Triathalon. Named for the unique and beautiful all white white tailed deer that make this area home, the White Deer Triathalon is unique. It features a paddle component (canoe, kayak or paddle board) in place of the swim component along with the standard biking and running component. Don’t delay registering, they do cap participants at 350. Don’t forget about Fourth of July Celebrations! The Star Spangled Jubilee is the quintessential 4th of July celebration similar to what you’ll find in most of these beautiful Northwoods Wisconsin communities. The Boulder Junction event kicks off at noon on the 4th of July with a parade down main street, followed by a music and dance party at 8:30pm and capped off by 4th of July Fireworks at the Boulder Junction Airport. There’s nothing better than a small town celebration! And the Boulder Junction Musky Jamboree at the end of July is one you should not miss. From a fish fry cook off, to a kids casting contest, an incredible classic car show and an amazing art & craft show, this small town celebration has it all! Follow this link - - > HERE to find a current year calendar of events for Manitowish Waters. On this calendar you’ll find unique events like the weekely Skiing Skeeters Water Ski show that takes place every Wednesday and Saturday at Rest Lake Park. If birding is your thing, the Birding Festival in May at the North Lakeland Discovery Festival helps you explore the birding possibilities in the Northwoods of Wisconsin during peak migration season for warblers. In addition, Manitowish Waters is the location of a spectacular vintage Boat and Car Show held at historic Little Bohemia on Little Star Lake. Don’t miss the many beautiful wooden boats that are on display at this event. The Manitowish Waters Fourth of July festival is also unique as it features plane rides, a parade through downtown featuring a vintage plane fly-over and of course fireworks by the shores of Rest Lake. If you love to explore the local art scene, artists in Manitowish Waters, Boulder Junction, Land O’Lakes and many other towns in the Northwoods of Wisconsin participate in the Northwoods Summer and Fall Art Tours. These “choose your own adventure” art tours let you discover where and how these talented artists create their art. You can choose to visit the artists closest to your vacation rental property or map out an all-day adventure that takes you through the many quaint towns in the Northwoods visiting and learning about the local artists that call this beautiful place home. Click HERE to learn more about this event and make a plan to book one of our vacation rental properties as your home base for this artistic adventure! 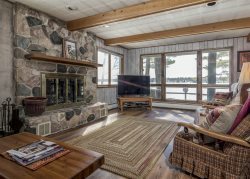 Finally, you can click HERE to customize the calendar of events in the northwoods location or locations closest to your vacation rental property. Or customize your event search to include pet friendly events, active events, local farmers markets or whatever type of event that you enjoy most. This calendar from Travel Wisconsin is a great way to find ways to make memories during your Northern Wisconsin vacation.